Just a few thoughts today about the content of the Ancient Path that is the Apostles’ Creed. What are the indispensable truths that all true Christians believe? There is no God. No, there is one. And only one. “God” is just a universal force. No, He is personal. God is not ultimately powerful. No, He is almighty. There may be a God, but our world is the product of a cosmic accident. No, God made everything. Jesus was just a good man. No, He is divine. Jesus is one of many really good, spiritual men. No, He is qualitatively different … the only Son of God. Jesus is just a good example for us. No, He intends and expects to be our ruler and master. Jesus was born like any other man. No, He was conceived miraculously, as is befitting, even necessary, for an incarnation of God on the planet. Jesus didn’t really exist in history. No, He did – in a real family, in a real place, in real political life. Jesus’ “death on the cross” was a sham. No, He was really crucified, really died, and was really buried. Since Jesus lived at a certain time in history, he is irrelevant to those who lived before his time. No, the truth of His life and message has been made known to all who have died in the past. Jesus didn’t rise from the dead. Oh, but He did. Jesus is dead and gone, and his remains are somewhere here on earth. No, He went to heaven directly after being resurrected. Jesus led a nice life, but can’t be active in our lives now. No, He remains alive, in the presence of God His Father, hears our prayers, and acts on our behalf. Jesus’ time in history is over. No, He is involved now, and has promised to return. Because of Jesus, everyone goes to heaven. No, Jesus is going to come and judge us, and not all will be found innocent. When we die, we just vanish into nothing. No, both the believing and the unbelieving dead are going to be raised, and judged. Life is everlasting, with or without God. The presence of God cannot be found or experienced on earth. No, God Himself, the Holy Spirit, is living and active through His people, the church. I believe in God, but don’t think the church is important. No, the church is God’s idea, Jesus is it’s head, and every believer is a part of it. Christianity is just for westerners – leave other cultures alone! No, Christianity is “catholic”,* meaning it’s for everybody in history, in every place, for every nation, and for every ethnicity. Christians aren’t any different than anybody else. No, we have been “sanctified”, made holy, made “saints” – both those who have died as Christians, and those who live as Christians. I don’t believe I’m a sinner. No, you are. All are. All need to be forgiven by God for our violations of His laws. And that forgiveness is made available by God, through Christ, by the Spirit, as proclaimed by the church. That is a lot of truth in a concise creed! It truly is good news. So good to believe, so good to know, so good to use. * The Lutheran Church Missouri Synod substitutes the word “Christian” for “catholic” in the Apostles’ Creed. Since the Roman Catholic Church uses the term “catholic” in its branding, using it in the creed led to confusion, and ultimately to the change. But, the word “Christian” simply isn’t the same as “catholic”. Some have encouraged the word “universal” as a synonym, but this limits the idea to geography. This Lutheran would be pleased to see our denomination reclaim the word “catholic” for our usage, because there’s nothing wrong with it, and there is no word like it – it’s the right word that our ancient forefathers selected and codified. 7th Day of Christmastide – and the feast day of St. Sylvester. Sylvester, born in Rome, was ordained to the ministry during the peaceeful days before the persecutions of Diocletian. He passed through those days of terror, and eventually saw the triumph of Constantine in the year 312, and the Edict of Milan in 313, which made Christianity legal in the Empire for the first time in centuries. Two years later he became Bishop of Rome, a position held for 24 years until his death in 335. The Council of Nicaea took place during his papal ministry (325), but he didn’t attend because of his advanced age. He sent his legates in his place, but ultimately it was his “sign-off” on the Nicene Creed that was critical for Western acceptance. 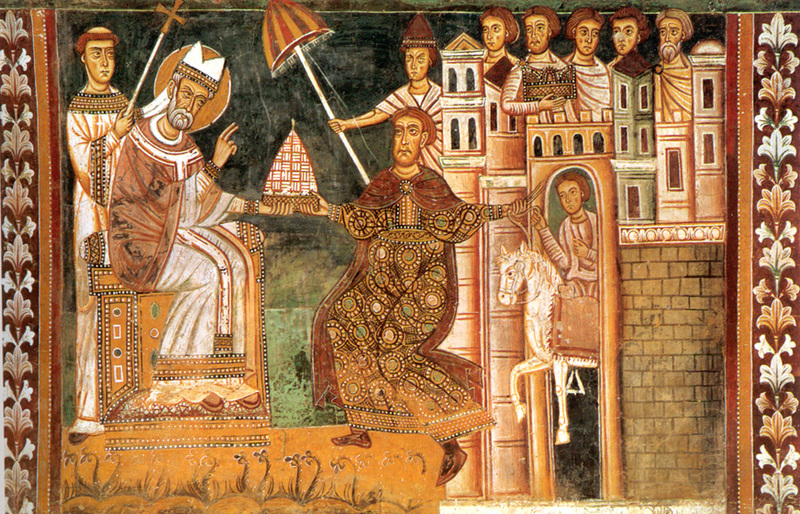 St. Sylvester was Pope for twenty-four years and eleven months. He died in the year 335. His Feast Day is December 31st. Sylvester saw so much change: Peaceful days, heavy persecution, Constantine’s triumph, church freedom and prestige, ecumenical councils, and the move of the Empire’s center from his home town to the east. How I wish I could have a cup of coffee with him, and hear all of those stories.